This year flavoured gins are the drink of choice! Gin-loving millennials are excited by the pink, strawberry options and gin experts love that they can experiment with new, aromatic flavours. We caught up with, Gareth Irvine, founder of Co Down gin producer Copeland Spirits, to find out exactly how to shop for and serve flavoured gin this Christmas. It’s a hard job, but someone’s got to do it. Label-checking is a must to be sure you’re getting what you want. Gareth explains: “Some flavoured gins are truly gins, whilst others are gin liqueurs. For instance, a gin will have a volume of around 35% or more whilst a liqueur might only be 15% so if it’s a gin you’re after be sure to check the label. “Many people will buy their favourite gin and add a gin liqueur to it to create a flavoured gin but with plenty of high volume options out there, this isn’t necessary." It turns out some flavoured gins are purer than others. “Many flavoured gins and gin liqueurs contain syrups and sweeteners so powerful they can completely mask the taste of the gin itself," says Gareth. "This is usually because the base gin that is used is really poor quality. 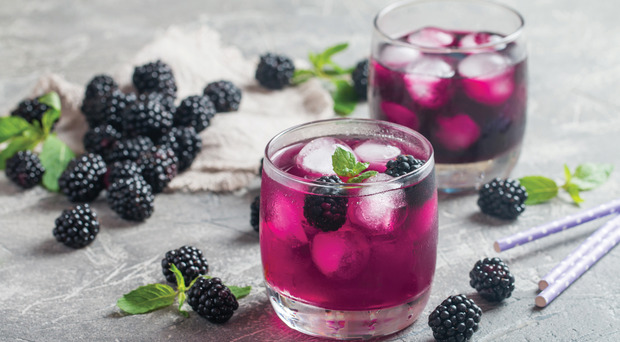 While those vibrant purple or neon-like pink gins might look great on the shelf, they are usually packed with artificial colourings. “Authentically flavoured gins are flavoured over a long period to deliver a natural finish. All of our gins are infused with fruits and herbs that we source locally and each batch takes around three months to complete. “Our newest release is a winter-inspired Spiced Apple and Blackcurrant flavour, and we actually started the infusion process for it in September to ensure both the flavour and colour were just right, and created naturally. Gareth’s advice is to stray from strawberry to explore the full offering. Gareth’s final tip reminds us to embrace the flavour. So there you have it folks - your complete guide getting flavoured gins right this festive season. Always drink responsibly. Visit drinkaware.co.uk for more.